1. 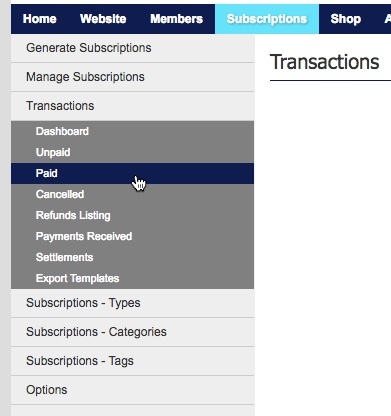 Within the Management Console, select Subscriptions from the top menu, then Transactions from the left menu. 2. Select Paid from the expanded left menu. 3. Find the member's transaction that you wish to resend the receipt for. Use the Search function if you have more than one page of transactions. 4. Click on Receipt next to the member's name, then Send Receipt to resend the receipt to the member. When your members pay their registration they are automatically sent their receipt via email, in the case that a member has entered their email wrong or lost their receipt, you can resend it to them from within the Management Console. You can also use this to send a receipt to those that make a manual payment.